The vet team at Frank Samways Vet Clinic are in the midst of scrubbing up and prepping for a marathon of great proportion. In just 24 hours they will take on the mammoth task of desexing over 50 cats well into the wee hours of the night. And by the end of this week they will have performed over 100 low cost desexing surgeries. 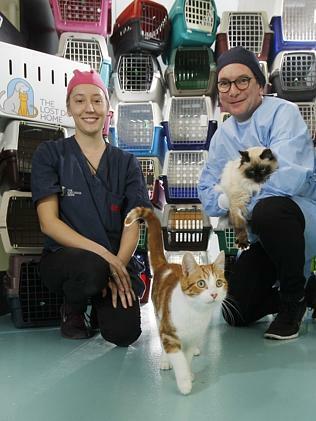 Starting at 4pm Thursday, the team will be desexing and then nursing cats through their recovery until dawn, ensuring that every cat returns home in good health and ready to begin life as a happier and more content desexed pet. Most importantly, they will be unable to contribute to the growing population of stray and unwanted cats and kittens. Almost 80 per cent of all abandoned and surrendered cats and dogs that arrive at The Lost Dogs’ Home are not desexed and with kitten season right around the corner our aim is to reduce the number of cats being born and in turn, the number of cats being admitted to our shelters. Immediately after announcing the special offer, the Home’s phones went into meltdown with hundreds of expressions of interest from cat owners. Dr. Alan Bolton, senior veterinarian at The Lost Dogs’ Home Frank Samways Veterinary Clinic was amazed at just how quickly the offer was taken up, “As we work our way through our registration list we have been struck by the real need to offer low cost desexing. Desex in the City will see over 50 cats desexed in one night, and over 100 cats throughout the week! The flow on effect of these surgeries means we will in effect prevent a potential 4800 unwanted kittens from being born this year alone. Cats become fertile as early as four months of age and a single female can produce an average of three litters of 4-6 kittens per year. Therefore, It is entirely possible for one cat to have up to 48 kittens each year it is fertile. In two years, one female cat and its offspring can produce approximately 20,000 kittens. It’s important to consider the cost of owning a pet over it’s lifetime, please take a look at our fact sheet on the annual budgeting for a cat.